Crags Road, also known as “The Rock Garden” or “The Creek of Doom,” suffered major blows this winter, first by the Woolsey Fire that decimated the hillsides, then rainstorms that tore the trail up pretty badly and covered parts with rock slides. We worked on this section not far from the M*A*S*H site in November 2017 (see photo above) and now we’re going back to fix it again. This is a combined project between California State Parks, the Santa Monica Mountains Trails Council, CORBA and Girlz Gone Riding. All tools will be provided, as well as instructions on how to use them safely and effectively, by experienced trail crew leaders. No experience needed – everyone works at a rate they’re comfortable with and takes lots of breaks. Bring a snack to eat on the trail; CORBA will provide lunch after the event for those who sign up here. Wear sturdy hiking boots with good lugs, long pants, a long-sleeved shirt, sunglasses, sunblock and a hat, and bring water, snacks. Bring work gloves if you have them. We have a few pairs we can loan to people without. 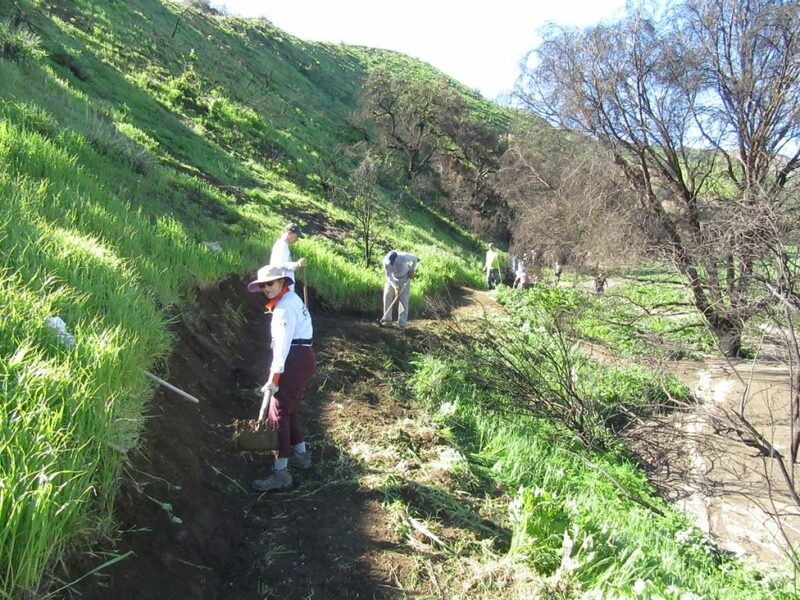 Trail Days 2019: We Need Your Help to Restore Sycamore Canyon Trails April 26, 27, 28! The primary focus of the work was to move the trail slightly uphill, further from the flood plane where it had been buried by mudflows. Because of all the rain, the soil was quite soft and quite easy to dig out and pack down. This made the work easier than normal, but still there was a lot of dirt to move where the cross-slope was quite steep, and there was one section of about 20 feet that was covered by large rocks that had to be moved. View more photos of the work day in our Spring Trail Work Day photo gallery. This month, our friends at the SAMO Fund, a non-profit partner of the Santa Monica Mountains National Recreation Area, are in a competition for funding through REI called “Loving Our Local Outdoors”. Between March 7th and April 8th, 2019, customers who make a purchase at one of eight local REI stores will receive a voting token and can vote for their favorite organization/project. The Santa Monica Mountains Fund is up against Friends of the LA River and Friends of Joshua Tree. While we are competing for the funding, supporters can rest assured that this is not a winner-loser situation; all organizations will receive funding in proportion to the number of votes received by each. November 2018’s Woolsey Fire decimated 88% of National Park land in the Santa Monica Mountains, proving to be the most devastating park fire in the area since the Green Meadows Fire in 1993. The popular Backbone Trail that travels through the mountains has suffered extreme damage that creates safety issues for visitors. A few sections favored by mountain bikers remain closed due to fire-destroyed bridges, excessive erosion and large slides from torrential rains on the burned hillsides. However, the biggest challenge to reopening the closed sections of the Backbone trail is the replacement of burned bridges. Without those bridges, the section of the Backbone Trail will remain closed to the public. With funding from this REI grant initiative, the SAMO Fund will be able to support and supply the needed materials for this project and help get this trail fully reopened to the public. 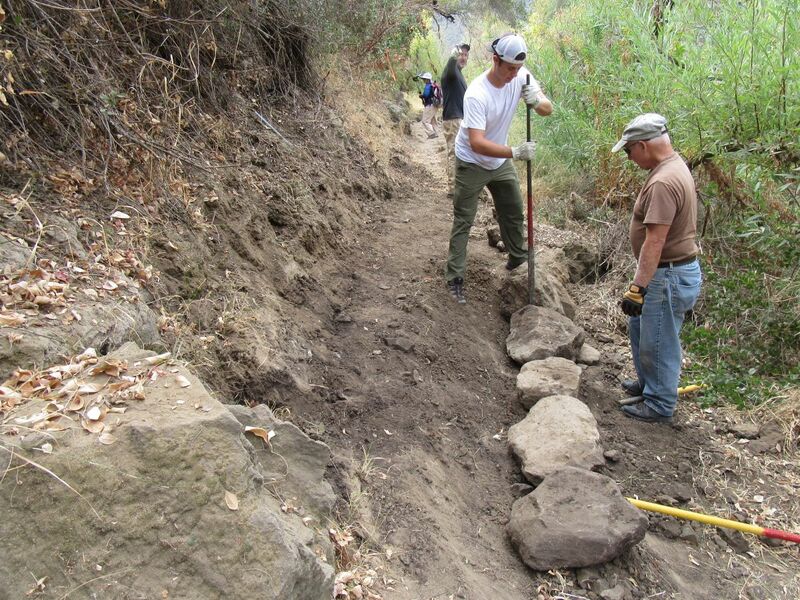 CORBA is committed to restoring the closed sections of trail, and will be applying for additional grant funding in support of the effort to re-establish and reopen the Backbone trail. This is an opportunity to help raise additional funds needed. Bridge replacement costs could run into the six-figure arena. To vote for the Backbone Trail restoration project, visit one of the participating REI stores listed below*. With every purchase you make, you’ll receive a voting token that you can place into the SAMO Fund bucket. The more tokens they accumulate by April 8th, the more funding they will receive, and the sooner we can get those trail sections back in service. * REI online customers will not have the opportunity to vote, unless you use free delivery to a participating REI store for pickup. – March 2: The Backbone Trail between Kanan Road west to Yerba Buena Road has been opened. South of the 101 Freeway, the Woolsey Fire completely decimated most of the open space between Las Virgenes/Malibu Canyon Road on the east and Point Mugu State Park (Sycamore Canyon) on the west. North of the 101, most of the open space south of Simi Valley and between Valley Circle on the east and Erbes Road to the west was destroyed. With the recent rains, the regeneration process has begun and new growth can be seen on the burned hillsides. Nevertheless, many of the trails are still closed until they are assessed for damage, and repaired as necessary. In addition, heavy rains my result in mudslides that may damage sections of the trail that survived the fire. The good news is that many of the trails are now open to use. The bad news is that during the Federal Government partial shutdown, the National Park Service is not able to work on their trails, prolonging the time that they will be closed. The following list is not exhaustive – there are many smaller trails not listed that may be open or closed. If you see that a trail is marked as closed or cordoned off, please stay off it. Malibu Creek State Park. Keep in mind that the two wooden bridges on the Grasslands/Las Virgenes Trail were destroyed, but you can hike-a-bike across the streams if they don’t contain too much water. Also, the “Creek of Doom” section of Crags Rd has experienced rock slides. Point Mugu State Park (Sycamore Canyon). The areas of the park with biking trails weren’t affected by the fires. Topanga State Park. This area is east of where the fire burned. Closed: Oakbrook Regional Park and Chumash Museum. For your own safety and to protect the plants and creatures that live in the open space, please stay off closed trails completely, and where the trails are open to use, please stay on the trails! Also, watch for new hazards on the trails such as large ruts, debris slides, washouts and fallen trees. CORBA’s eTerraTimes newsletter for March was posted today, February 28th. If you don’t get it by email, you can view the online version on our website. We’ve been overdue for an update, and as President of CORBA, I have to apologize for the lapse in communication as to our many ongoing efforts over these past few months. For me personally, it has been a challenging year, but the one thing that has not lapsed is CORBA’s dedication to improving trails and mountain biking opportunities in and around Los Angeles. Opening of Sapwi Bike Park in Thousand Oaks with the first public pump track in the area (phase one). 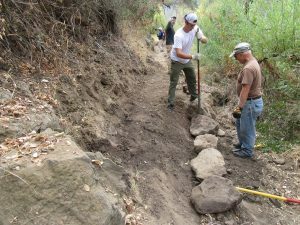 Volunteer construction and opening of 3+ miles of new multi-use singletrack trail at East Walker Ranch, City of Santa Clarita. Completion of the San Gabriel Mountains National Monument Management Plan, with significant review and input from mountain bikers through our participation on the SGM Community Collaborative. 11 free Skills Clinics held at Malibu Creek State Park. (For the first time in more than 20 years, we had to cancel a clinic due to the Woolsey Fire). Monitored and responded to legislation affecting bicycling on our public lands. However, even with all these successes, CORBA’s biggest challenge is that our membership numbers have declined by 40% since December 2017. 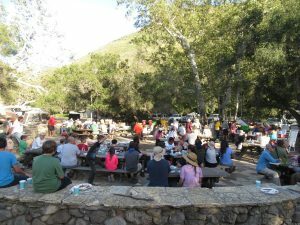 While we have been highly successful in our grant applications, receiving almost $85,000 in grants that have supported Sapwi Bike Park, new trail construction in Santa Clarita, restoration of Station Fire damaged trails, tool purchases, and our Youth Adventures program, all of those funds are allocated to their respective projects, not to CORBA’s operating expenses or advocacy efforts. Our board of directors has continued to work tirelessly on behalf of mountain bikers throughout the greater Los Angeles area. There are only five of us, and we’re all at capacity. As unpaid volunteers, we can only give so much of our time. It’s your memberships and donations that keep us going. However, with several ongoing projects, including trail maintenance, Woolsey fire recovery, efforts to complete Sapwi Bike Park, create a new bike park in the City of Los Angeles, plans to develop much-needed mountain-bike optimized trails, preventing trail closures due to Wilderness, and helping form a state-wide California Mountain Biking advocacy group, our plates are already full. Regardless, our past successes and your enjoyment of them is what drives us to continue to work and advocate for mountain bikers in and around Los Angeles. Crags Road, also known as “The Rock Garden” or “The Creek of Doom,” suffered major blows this winter, first by the Woolsey Fire that decimated the hillsides, then rainstorms that tore the trail up pretty badly and covered parts with rock slides. We worked on this section not far from the M*A*S*H site in November 2017 and now we’re going back to fix it again. Restoring Crags Road through the “Creek of Doom” in Nov 2017. All tools will be provided, as well as instructions on how to use them safely and effectively, by experienced trail crew leaders. No experience needed – everyone works at a rate they’re comfortable with and takes lots of breaks. Bring a snack to eat on the trail; CORBA will provide lunch after the event for those who register online in advance to help us with planning (see below for the link to online registration). Please help us plan for the event by signing up online at https://www.meetup.com/CORBAmtb/events/259311989/ and also qualify for a lunch on CORBA. Thanks! 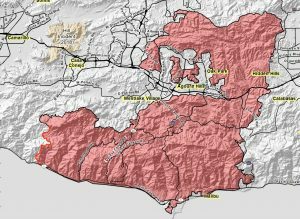 The Conejo Canyons and Western Plateau in Thousand Oaks have taken a real beating this winter, first by the Hill Fire that denuded the terrain, and then the heavy rain that resulted in ruts and washouts. 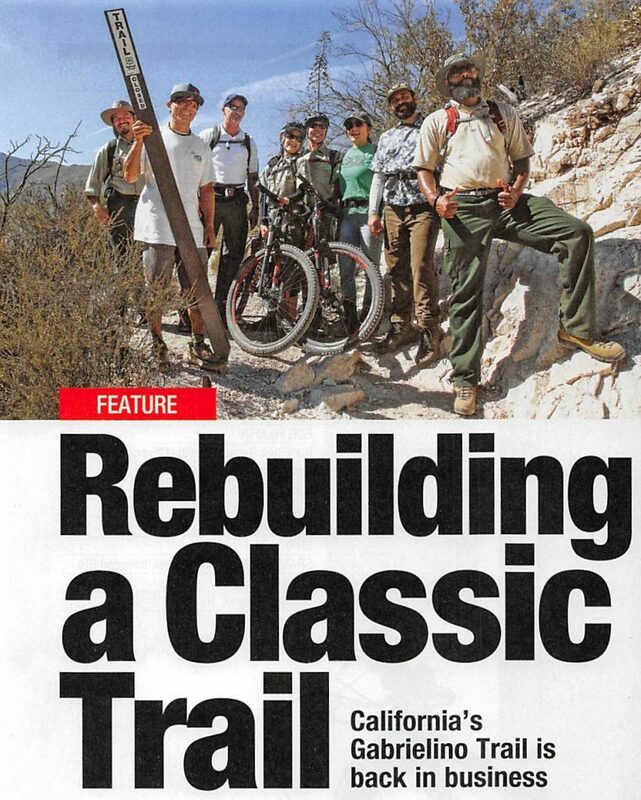 We’re going to get out there to restore these trails to their original glory! We use the Conejo Open Space trails regularly, so this is our chance to give back to the community while expanding our trail opportunities! At noon, following the morning of trail-building, workers will be treated to a thank-you lunch while enjoying the camaraderie of fellow trail enthusiasts! Wear protective clothing (long-legged pants, long-sleeved shirts, sunglasses), sturdy shoes, gloves, hat and sunscreen. No experience necessary. Tools and instructions on how to use them safely and effectively will be provided. Must be 18+ years of age. As always when in the open spaces, be aware of poison oak, ticks & rattlesnakes. Everyone works at their own comfort level. Follow instructions of park rangers and trail crew leaders at all times. Directions: From the 101 Freeway in Newbury Park, exit at Rancho Conejo Blvd heading north. Drive 1.8 miles, almost to the end, then turn left onto Conejo Center Drive. Continue 0.3 miles then park in the dirt lot on the right or at the side of the road. Help us prepare for the number of volunteers who will be participating by registering on our Meetup event.